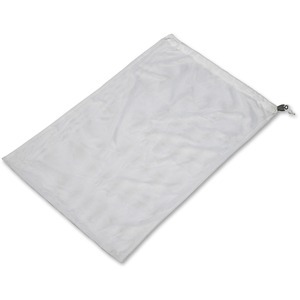 Medium-duty, multipurpose drawstring laundry net is excellent for delicate and fine washables. Made of polyester mesh, this laundry net is designed for washer or dryer use and helps prevent the loss of personal items. Ideal for socks and other small items. Drawstring design with plastic sliding device makes it easy to open and close the 30" opening. Laundry net holds up to 5 lb.